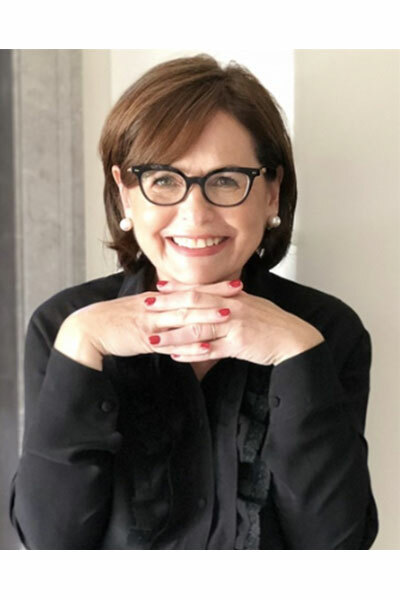 Suzi Weiss-Fischmann, co-founder of nail lacquer brand O.P.I. is a beauty industry legend. She’s criss-crossed the globe for years hosting editor dinners, instore appearances and influencer breakfasts. I’ve had the pleasure of meeting and interviewing her many times throughout her career and I can honestly say fame never went to her head. Yes, even living next door to the Schwarzeneggers in Los Angeles didn’t change her one bit. 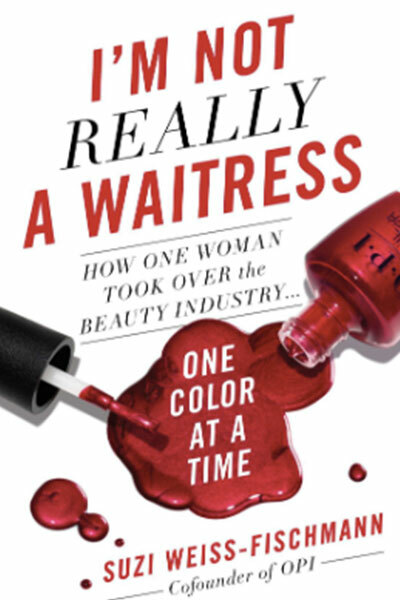 So it is exciting news to see that she’s just published a memoir entitled “I’m Not Really A Waitress: How One Woman Took over the Beauty Industry…One Colour at a Time.” It’s a hilarious and educational story of her path from immigrant in Los Angeles to her global success. Here is a little interview to give you an idea of what you’ll find in the book. Dave: How did you get your start in the beauty industry? Suzi: My start in the beauty industry actually came by way of the dental industry – the artificial nail extensions that were so popular in the 80s share a similar chemistry to dentures. I was in my 20s, working with my brother-in-law at a small dental supply company in L.A., and we noticed that nail technicians kept coming in to buy our products. When we realized what they were using them for, we knew we could make a safer, higher quality product. After two years of formulation I began dropping off OPI’s “Rubber Band Special” at every salon on Ventura Boulevard in Los Angeles. A jar of powder, liquid, and primer, rubber-banded together, became the OPI Traditional Acrylic System and was a huge hit, giving OPI its entryway into the professional nail industry. D: What’s with the crazy names for all the nail lacquers? 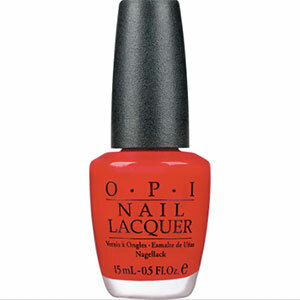 S: Before OPI, nail colour really wasn’t marketed to the average woman – it was marketed to nail technicians. The generic, utilitarian names already on the market – like Red No. 4, Pink No. 2 – were boring and completely forgettable because they didn’t really need to be remembered. At OPI, we wanted to make a nail colour an affordable luxury for women everywhere. (That’s also why we call our product lacquer – it really is of a finer quality than plain old “polish,” but it also speaks to the feeling of luxury we wanted to give our customers.) We were the first beauty company to advertise in women’s magazines because we wanted to reach consumers directly. By giving OPI nail lacquers unique monikers, women not only remembered the colours but asked for them by name. Many of the names are designed to make people laugh (like Toucan Do It If You Try), and others are imbued with personal meanings for their wearers – like Mimosas for Mr and Mrs worn at an engagement party or It’s a Boy! or It’s a Girl used to announce a pregnancy. D: How did you come up with the name I’m Not Really A Waitress for your trademark red? S: In Los Angeles, “I’m not really a waitress – I’m an actress (or singer/model/artist)! is a well-known mantra. The name exemplifies that we’re more than just our job. It speaks to anyone labouring for a dream, offering a reminder that our goals are worth pursuing. This shade is more than just a colour, but a form of self-expression. D: What was one big decision you had to make about OPI that affected the future of the business? S: When it comes to big decisions, those are easier to define in your personal life – getting married, having kids, buying a house, etc. In business, it’s not so clear. Every day there are decisions to be made, and most often, it’s not until much later that those choices become recognizable as big decisions that change or shape your business. The key here is to make those decisions quickly and with confidence – I consider making decisions to be my “business superpower” and think its crucial to meeting the ever-changing demands a business leader must face to grow a company. For example: I once developed a colour that everyone in the office hated. They described it as “poop in a bottle”. Usually my colleagues loved my colours, or at least liked them, but everyone was in agreement that this colour was terrible. I decided to trust my gut and put it out there, and You Don’t Know Jacques became one of our most popular colours. D: What’s your favourite OPI colour and why? S: Everyone wants to know which colour is my favourite, but of the many hundreds I’ve created, it’s impossible to pick just one! I can easily narrow the hue: red. I love the glamour of a perfect red nail. 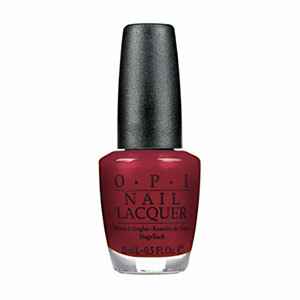 From there, three stand out – OPI Red earns a special place in my heart as the first red I ever created. Big Apple Red is another favourite and reminder of the city that gave me a new life after my family emigrated from Hungary when I was a little girl. Of course, I’m Not Really A Waitress, this books’ namesake and OPI’s bestselling shade, earns a spot on this list. D: You are known for predicting – and setting – trends in nail colour. What you think is the next big thing? S: In 2019, expect to see lacquer shades in pastel hues of lavender, baby blue, and pearlized white. Metallic glitter hues and embellishments like crystals will keep growing in popularity, and in nail art, negative space will be more defined and used in unique ways. In today’s era of embracing individuality, nails serve as a great medium for self-expression. 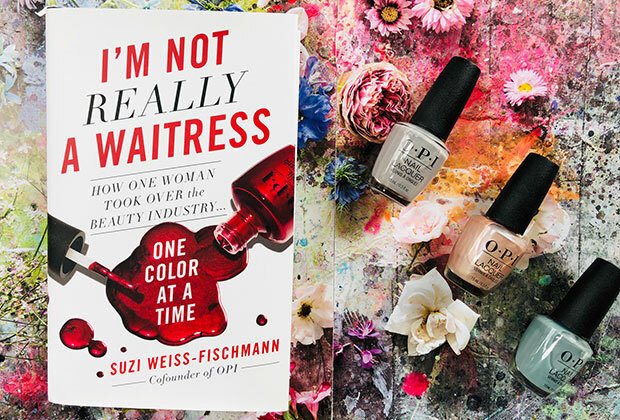 Suzi’s book “I’m Not Really A Waitress: How One Woman Took Over the Beauty Industry..One Colour At A Time” is available at fine bookstores and online now. It’s a fun read. Wonderful! I first saw the OPI line at a nail salon. Great interview. She is so relatable and her nail polishes are legendary. Love the shades too ???????? wonderful interview! so cool to learn about OPI and Suzi.